New Delhi, April 5: The Ambassador of the European Union to India, Tomasz Kozlowski on Friday said that the bloc would continue being India's largest trading partner despite Brexit, during a conference on Strengthening India-Europe Economic Relations at the PHD House here. He outlined the "balanced" trade between India and EU during his address, adding that the UK's exit from the EU would have no impact on India-EU ties. "Brexit will not have any impact on India-EU relations. Brexit: British MPs Back Delay Bill by One Vote. All agreements between the two will be implemented. We have a lot of plans with India and we will continue. EU will remain the largest trading partner and will continue to work towards increasing the ties including in the technological sector," Kozlowski said during the conference. "EU-India trade in goods & services reached 141 billion USD, our investments - 90 billion USD. Trade is balanced, our economies are complementary. 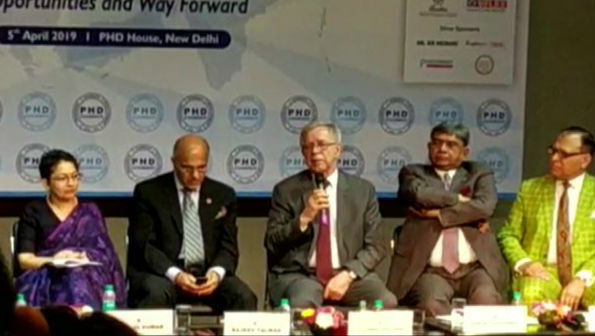 Still, speaking on Strengthening India-Europe economic relations at PHD conference, I underlined our potential is higher, we could do much more," the ambassador tweeted after the event. Speaking further on Brexit, Kozlowski said: "Brexit is not a positive development for both EU and Britain but it is a decision made by UK and we respect it. We have to move towards the integration process and the Brexit will not impact the process in the future. "Also present at the event on Friday were Ministry of External Affairs Joint Secretary (Central Europe) Anju Kumar and the Ambassador of France to India Alexandre Ziegler. The House of Commons has rejected the previously negotiated Withdrawal Agreement thrice now, with Corbyn indicating that the accord may be tabled again in the Parliament for a vote next week.No respite seems to be in sight for the United Kingdom, as it is now poised to exit from the bloc on April 12. While the opposition has called for a second referendum, May has dismissed the scenario. She now seeks another extension from the EU. As British MPs Vote on Brexit Options, EU Says it is 'Running out of Patience'. The EU, meanwhile, issued a strong statement, outlining that a "no-deal" scenario is likely after the Withdrawal Agreement was rejected for the third time. The British Parliament, however, has also rejected leaving the bloc without a deal.